Born: 1889, St. Matthew’s, Ipswich. 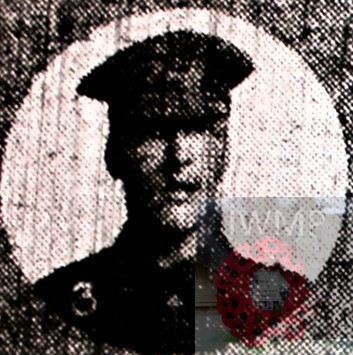 Died: 7th September 1915; age 26; KiA. Served 8 years in India with the King’s Own Royal Lancaster Regiment. Date of Entry Therein: 15th January 1915 – France. Regiment: King’s Own (Royal Lancaster Regiment), 2nd Battalion. Uncle to SPENCER JAMES POLLARD. 1891 57, Handford Road, Ipswich. Lancelot was 3 years old and living with his parents & siblings. James Abbott, 41, a Bricklayer, born Ipswich. Eliza Abbott (nee Collins), 40, born Grundisburgh, Suffolk. Charlotte Abbott, 17, a Laundress, born Ipswich. Ambrose Henry Abbott, 9, born Ipswich. Alice Elizabeth Abbott, 1, born Ipswich. 1901 5, Castle Street, Ipswich. Lancelot was 13 years old, a Butcher. He was living with his parents & siblings. William Abbott, 8, born Ipswich. Lancelot was 23 years old, a Soldier ranked Private, of the 1st Battalion of The King’s Own, (Royal Lancaster) Regiment. Soldiers’ Effects to Eliza Abbott – mother. 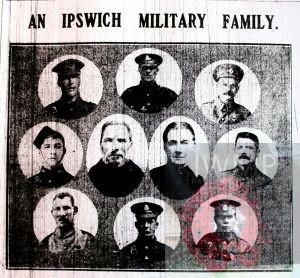 Mr. and Mrs. Abbott, 9, Castle Street, Ipswich, have three sons, two sons-in-law, and two grandsons serving in the Army, whilst another son has been killed. Their names and regiments are: (1) Lance-Corpl. C.J. Abbott, Essex Regiment, joined since the war, has been invalided home from France, and is now in India. Prior to joining was at the Orwell Works. (2) driver A. Abbott, who has served 18 years in the R.F.A., has been in France since the outbreak of war. (3) Sergt. L. Abbott, who served eight years in India with the King’s Own Royal Lancashire Regiment, went to France in February, 1915, being killed the September following. (4) Bombdr. W. Abbott, who joined the R.F.A. since the war, has been in France two years. (5) Pioneer E. Pollard (son-in-law) serving in France with the Royal Engineers, was prior to the war foreman with Mr. Kenny, builder, Ipswich. (6) Driver A. Castle, 19 years’ service with the R.H.A., has been in France since the war broke out, has seen service in France, being wounded in the leg. (8) Pte. S. Pollard (grandson) stationed in England with the Suffolk Regiment. Just got home from visiting Grand uncle Lancelot Henry, also visited Spencer Pollard my great uncle. i have pics of their cemetries and graves if any other family members would like them. I am related to to Pollards from the Stoke area of Ipswich. Charlotte Pollard was my Great Grandmother. My Grandmother was Margaret Ethel Haddock nee Pollard. Her brother Albert Edward was married to Ada Haddock my Great Aunt, they had two sons Spencer & Eric. I appreciate any photo’s if there are any available. Thank you. Lancelot Abbott was the brother of Charlotte Abbott. He was my great uncle, Lancelot was the uncle of Spencer James Pollard. Charlotte lost a son, brother and son in law in a matter of eighteen months.